Discussing my maternal role on a disability arts blog may seem odd – and possibly tiresome for those who have been following it ever since I began my film-making adventure - but I think it’s relevant given the expectations that might have developed of me as a prospective Deaf film-maker. I had expectations of myself in that capacity too – expectations that I am now uncertain I can fulfil at this present time. Personally and professionally, the last seven months have been an extraordinary journey. Just when I was about to build on a creative portfolio career incorporating writing, journalism, film-making and the visual arts, I found myself having to weigh that up once again against the harsh reality of parenting a child with CP in light of MRI scan results last April that revealed Isobel’s disabilities to be more encompassing than first thought. So where many parents give up the arts in favour of a steady income, my case is unusual in that I have to make that sacrifice in order to meet unpaid caring responsibilities. So for that reason – and through no fault of Isobel’s, but rather the expectations of those working with her – it feels somewhat more forced. Like fashion – a world that I was once a part of on the coat-tails of last century – I have found film-making to be fast-paced, capricious and not necessarily over-concerned about having artistic depth or substance, not so long as it can fill cinema seats anyway. Whether on set, in planning or during editing and post-production, I often had to be incredibly on the ball in order to communicate my ideas, such was the speed of verbal exchanges between members of the mainstream production team - even with BSL interpreters present. It wasn’t really the place to be complaining about getting left out. With a tight budget to work with and various deadlines to meet, we had to pack in as much highly skilled manpower as we could, and in as little time as possible, so everyone's skills were at a premium. But it was also terribly exciting. In contrast to the visual arts group projects that I managed in the past, I was realising a much more singular and personal vision, made all the more thrilling by the fact that it would be represented by moving images. I am grateful to the cast – among them Emily Howlett, Paris Palmer, Sienna Gray, Jenny Sealey (whom I consider to be a real coup given her Graeae commitments), and Sami Thorpe – for turning the subject-matter into something worth talking about through making the roles their own. Intriguingly, many of the viewers who commented via Facebook, Twitter or elsewhere expressed disappointment at how short CODA was. I don’t think we would have incited such a response if we’d stuck with the emotionally-detached David Lynch-seque series of visual tableaux that I’d originally envisaged. I guess subconsciously, I knew that this was a story that demanded a more epic treatment, but that the tableaux idea was a way of skimming over what was clearly a complex issue. Just as noticeable was how much of the feedback came from Deaf viewers who identified with the on-going frustrations of expressing their Deaf selves to hearing parents who didn’t ‘get it’, when in fact that was just the catalyst for the whole story. Having said that, I did want to address a taboo – the taboo of Deaf-hearing clashes within the family. In the 70s and 80s Deaf people’s education was basically hijacked by oralists who encouraged parents to bring up their children almost like pseudo-hearing people. Unfortunately, this attitude persists in some families today, ensuring that it remains a taboo; while rehearsing for Jenny’s big confrontation prior to the film shoot, people kept wiping the sweat off their palms. I knew the film was going to be roughly ten minutes long. It was clearly stipulated in the Zoom 2011 application guidelines. So for me to try and dress it with sugar on top would have jarred badly with the tone of realism that I’d set for the rest of the story. I would hope, though, that as the journey unfolds, it transpires by the end credits that the Deaf/BSL Community has become home for both Jenny and – ironically, given her fundamentally hearing status - Annabel. 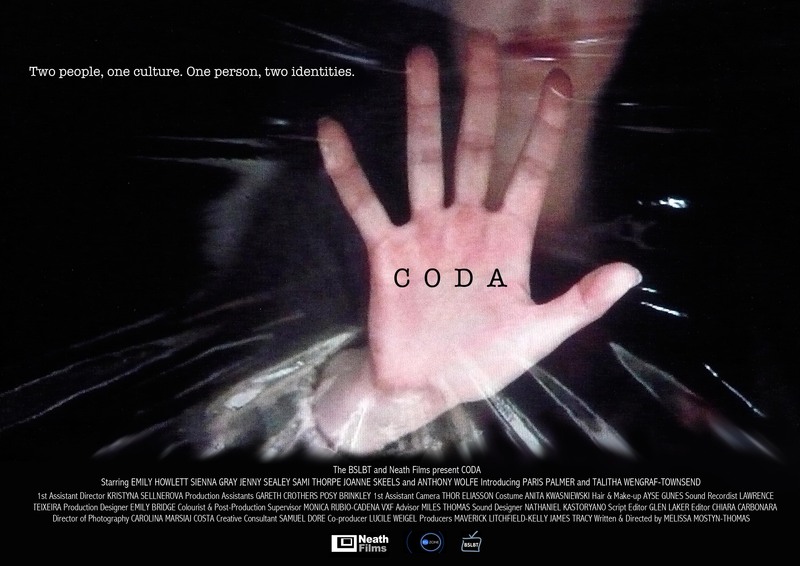 It cannot have escaped others’ notice either that CODA is virtually an all-girls’ film. Of course I drew from real life – I come from a predominantly female family, so it was only natural that I should want to explore the specific dynamic between mother and daughter, then granddaughter. But the idea of focussing on three generations of women also appealed to one of my producers, Jim Tracy, who himself came from an all girls’ family – and the BSLBT, who liked the unusual angle to a challenging subject. Another aspect that attracted me to film-making was the scope it gave for subliminal messages. Having abandoned the tableaux approach for CODA, I was keen to incorporate some other sort of symbolism to reinforce the sense of history repeating itself. Originally, Jenny was to wear a white Botticelli-style dress representing innocence or naivety when asserting her identity to the family, which would then be adopted by Annabel in the final showdown. Thanks to time and budget constraints, that idea also went out the window. Instead, I worked with costume designer Anita Kwasniewski to inject shots of one colour throughout the film. Hence, 10-year-old Jenny wears bright scarlet at the beginning, echoed in the leaf print that flecks her maternity dress at age 20. In the nursery scene, the baton gets passed to little Annabel via her red tights, when she conveys her alienation from the other hearing children. Finally, with Annabel’s emergence from the shadows in adulthood wearing all-over scarlet, the relay of Deaf cultural values from mother to daughter is complete. That the nursery entrance and the speech therapy door are also red are happy accidents. I loved making CODA. I am sad that I may not be able to build on its success - and in particular working with Neath Films – at this present time, including applying for Zoom Focus 2012, the next level up for Deaf film-makers who participated in Zoom 2011. That's not to say I don't feel the tug still, but it is just that right now, I am not able to satisfy it. To that end, I would like to thank the BSLBT for persevering with me – I know they were initially concerned that I was tackling such an ambitious subject for a film-making novice – and to Neath Films for believing in me. It has been illuminating working with a great mainstream production team, and I look forward to seeing more of their collaborations with Deaf film-making talent.